Tired of long and complicated forms when writing your annuity, life insurance or long-term care business? Want to easily capture client signatures? Want your business to run more smoothly and so you get paid sooner? There's a solution — use e-App for your applications. Bill does, and his business is better. Watch this new video and see just how much happier e-App makes his life. In this on-demand webinar you will learn about IRA clients with RMD—a 10-minute idea to raise $250,000 in new assets, The rainy day money idea and Indexed annuities as a bond alternative. In an exclusive interview with Senior Market Sales® (SMS), renowned economist Roger Ibbotson shared groundbreaking insights that are challenging the traditional ways retirement planning professionals mitigate certain retirement risks. Helping clients enroll in Medicare and review plans annually can be an easy way for financial advisors to reach prospects and lay the foundation for lifetime clients, and a recent survey indicates the opportunity is especially ripe with affluent Americans. 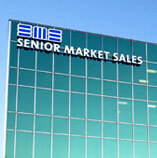 The SMS Medicare Solutions and Financial Solutions teams have extended their hours to better serve agents and advisors. You can help clients answer one of their biggest questions: “Can I afford to retire?” Senior Market Sales® has a new tool that makes it easy for any type of retirement planning professional to help clients answer that question. Income ArchiTECH™ shows the impact of longevity risk on their retirement plans. With just a few clicks, it can show the impact of market fluctuation and help you develop strategies and solutions to manage it. Explore the possibilities of cross-selling annuities to your existing Medicare clients, using a proven process from leaders in the Medicare and annuity markets. There is a way to provide clients more big-picture clarity while also demonstrating the need for the solutions you have to offer. Start using a new process and tools to enhance your business. Scott comes to Senior Market Sales as an Internal Marketing Consultant with nearly four decades of experience. As the abundance of information and advances in technology empower consumers to confidently manage their own financial investments, returns-focused financial professionals must shift to a more relationship-focused practice. The Office of Management and Budget (OMB) and the Department of Labor (DOL) have agreed to delay the Best Interest Standard until July 1, 2019. What does this mean for advisors? No matter the industry, everyone’s talking about the importance of the customer experience. But the insurance and financial planning industries especially need to pay attention, according to several trade publications reporting on critical trends in the new year. Learn about this unique crediting strategy that can reduce RMDs. Certain fixed indexed annuity solutions can offer a crediting strategy that cuts RMDs. Introduce the saw-tooth strategy to clients and help them keep more funds in qualified accounts. The Department of Labor has announced a 60-day extension of the implementation of the fiduciary rule. Advisors will be treated as fiduciaries beginning on June 9, 2017 rather than April 10, 2017 as originally scheduled.